Known for its resemblance of the pomegranate seed with its abundant red arils and size the Rhodolite garnet is said to bring health and cheerfulness. 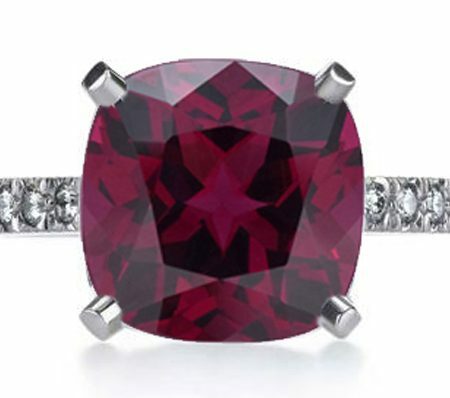 Rhodolite Garnet is a pinky red colour, the name comes from the Greek word “rhodon” meaning rose. Garnets have been used since the Bronze Age as gemstones and abrasives. The name “garnet” comes from 14th century Middle English word gernet meaning ‘dark red, possibly a reference to “pomegranate”, a plant whose abundant vivid red arils contained in the fruit are similar in shape, size and colour to some garnet crystals. Garnets have always been extensively used throughout the East and amongst the Greeks and Romans. The Romans frequently using them for engraving, in India and throughout the far east it was known as an Amulet against poison and the plague, worn to attract health and cheerfulness, and as a protection against lightning. Deposits are found in Brazil, India, Sri Lanka, Tanzania, Thailand and the USA (North Carolina). At the auction of the Estate of Jacqueline Kennedy-Onassis at Sotheby’s on April 24, 1996, a striking cabochon garnet flower brooch from the 19th century was sold for $145,000. In the same year a university student unearthed in central Australia what is believed to be the largest single garnet find ever. This giant rough is thought to weigh thousands of tons and measures nearly a hundred feet across. It is the birthstone for January.